First off, it's best to send a PM as opposed to a post along with the part number if you can for easier response on my end and tell me if you can pick up vs ship. It would be much easier to stop by and pick up parts, and / or help to remove them yourself if you want a good deal and quicker response time. I live near Tustin, CA so I'm fairly local to anyone in So Cal. I will do my best to respond to requests in order I receive them but my time is limited and so I may not respond right away. I will prioritize larger orders first in order to maintain my sanity. Once I get some of the larger items and bigger orders (> $100), sold I can return to the smaller stuff later unless you want to stop by. Sorry. I think the part number is 61-31-9-133-024 (with fog lights option). Last edited by mgianzero; 12-06-2018 at 02:53 PM. I only need the top of the airbox (lid) if it's in perfect condition. Price for Motor? Would need to be shipped up to washington. 98043 if you look into price. 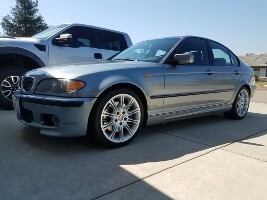 My motor just took a dump and was thinking about getting rid of my ZHP... however If I got a 60k motor.. Need a few other smaller bits and bobs if you can ship that motor up. Marc, are you getting my PMs?